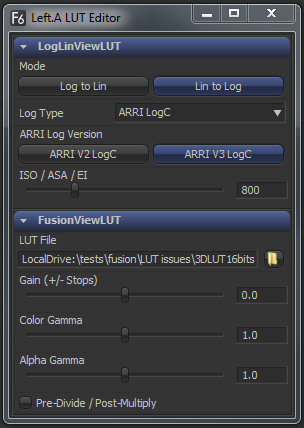 ← Grading artists LUT files in Fusion. Buried in the Fusion manual is a useful feature allowing you combine (stack) image LUTs. If your working with a colourist this feature allows you to use their colour grade in a linear fusion workflow. This article shows how to set up this workflow and explains the work arounds you may need. The display view context menu can be used to stack image LUTs into a processing chain. For example, when loading a Cineon file in Log colour space, the artist may wish to first apply a Log->Lin conversion, followed by a Fusion View LUT to apply a colour calibration. Why work with a colourist? An advantage of working with a small studio is that I can get 3dLUT files from the grading artist before I start my work. This will show me something close to the final look, and allow me to compensate for issues that may arise. This is especially important if I’m working on ‘hot’ fx like flame, lens flares, glows, etc. I need to know how the shot will be graded. If I’m not careful, the grade will simply clip the bright spots, and flatten out my lovely detail, or produce odd colour shifts. The 3d LUT will not show me the effect of any special regions or masks used in the grade. It’s simply a one to one mapping of colour values, i.e., showing how THIS colour value from the source file will equal THAT new colour value on screen. Using a colourist’s 3d LUT file in a Log workflow. If this whole Log to Lin thing messes with your head then import your image sequence and set the Cineon loader to Bypass. Then set your viewer to use the 3d LUT from the colorist, and off you go. The colourist 3d LUT maps the colour directly from the Log data to a Display (normally ‘rec 709’). As compositors working in linear colour, we need to create a viewLUT that goes from Lin ->rec709 using the 3d LUT from the grading suite. This is a two step process, first reversing the linearization operation to return to the file’s original Log colour space, then applying the 3d file LUT to go from Log ->rec709. In theory you can use Stacked LUTs to go from Lin->Log then Log->rec709. In practice, Fusion’s ‘Log-Lin View LUT’ can let you down. Before using this Stacked LUT setup you should check the ‘Log-Lin View LUT’ works correctly by doing this GPU clipping test. Check the Graphics card does not clip super whites. Check Prefs->Tweaks are set to float16. Check Image Loaders are set to float16. If everything checks out you can use a ‘Stacked LUT’ to view your work. BUT, if the GPU clips you need to use one of these work arounds . Build your own LUT cube, using a BC node to scale the inputs so that it doesn’t clip (See how here…). The tool flow for this setup is the same as my simple log to lin workflow. The only difference is how images are displayed in the viewer. Image sequences are imported at a bit depth of float16. The Cineon Log tool is used to convert the log colour space to a linear colour space. Choose a log type based on the camera. 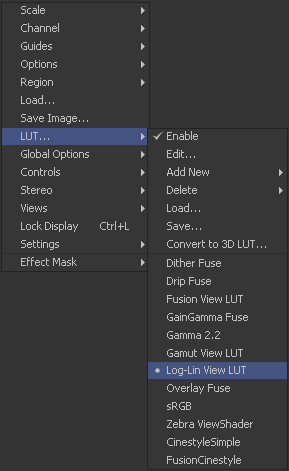 Set the tool Mode to convert Log to Lin. Next add the Fusion View LUT. Now we can reverse the loader’s Log to Lin operation and apply the colourists 3dLUT. 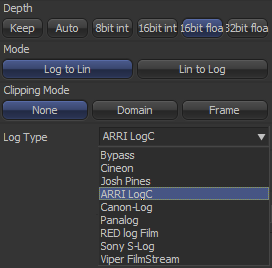 Choose the ‘Log type’ based on the camera. That’s it. The viewer is now set up with a stacked LUT. What you see on your screen should be something close to the grading suite. What if you don’t know the camera’s Log type? But Fusion’s viewers, loaders and savers must share the same Log type. So long as the Log type of the input sequence matches your final output, everything will work fine.